What are those strange rubber circles on the beach? It seems like several times a summer someone ask me about "those strange rubber circles" they find on the beach. These are the sandy egg cases of Lewis's Moonsnail, Euspira lewisii. The eggs are laid in this distinctive collar, which is molded by the shape of the shell as it is released from the snail's body. The tiny eggs are spread out in the jelly-like center layer and then both sides are covered with sand; they will hatch in about 6 weeks. These egg collars are regularly found in the intertidal zone from April to September. 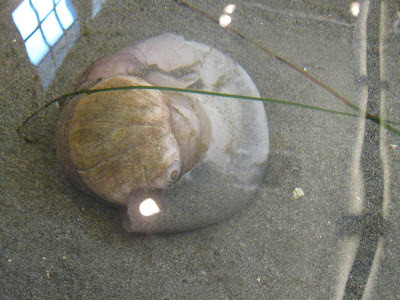 Lewis's moonsnail laying its eggs in our touch tank! Moonsnails burrow in the sand to hunt clams. If you find a clam shell on the beach with a perfect hole in it, the clam was preyed on by a moonsnail. They drill holes in the clam shells and actively cut up the flesh of the clams with their tooth-like radula. Adults will eat about one clam every 4 days. Doug Rogers, from Washington Dept of Fish and Wildlife, investigates a newly laid moonsnail egg collar (you can see an intact one under his hand). Doug was excited to see the handy work of this moonsnail, which he collected for us in the spring. Yesterday the Monterey Bay Aquarium Research Institute (MBARI) redeployed their deep-sea webcam. That's right, a webcam that has been placed 880 meters down -- that's 2,886 feet! -- is transmitting steaming video to us landlubbers via the internet. Not only that, they also attached a sea lion carcass so resident animals could feast and show themselves on the webcam. Click here to watch the live video. I think I'm looking at a bunch of hungry, hungry hagfish. What do you see? Note: You may need to download the latest version of Microsoft Silverlight if you haven't already. Click on the download link provided on the MBARI page. We feed our animals 3 times a week (not counting the filter feeders like clams, barnacles, plumose anemones etc... who are constantly taking in plankton). Most of the animals eat more than one type of food, thus we must constantly update a long feeding chart that gives specific instructions on what to feed to each animal. On a normal feeding day we defrost about: 4-5 Pollock fillets, 30-50 clams, 1 cup of krill and any extra fish we may have (such as previously dissected herring or squid). Additionally, if the kelp is fresh, we collect a few feet of it to feed to our urchins and abalone. With the aforementioned food we create a feast that could feed a small army. We cut the fish into a variety of sizes, create a fishy "milkshake" with half of the defrosted krill and cut up the smelly herring to feed to our crabs and shrimp. Prepping the food does not even compare to the joy I experience when feeding each animal. Some of the fish, such as the Walleye Pollock are gluttonous, thus we have to monitor how much we feed them while other fish seem to be much more picky. Getting to know the habits and preferences of each critter has been rewarding this year! Today I will spend some of my workday making krill ice cubes for our daily feedings, accept an 80lb frozen fish delivery of Pollock and smelt and add check on the bryzoan/anemone food level in our nudibranch tank. The job never ends, but it is worth it to see the animals happily graze away! I only wish I still had someone to dote on me like this. Join us for formal and informal feeding programs by checking our events calendar! We generally feed our animals throughout the day on Mondays, Wednesdays and Saturdays. Perhaps you will get a sneak peak at them snacking when you visit the Marine Exhibit! Real Washington weather is finally back today--the fog is rolling in from the Strait of Juan De Fuca and it's cool enough to make me wonder about wearing pants or shorts to work. 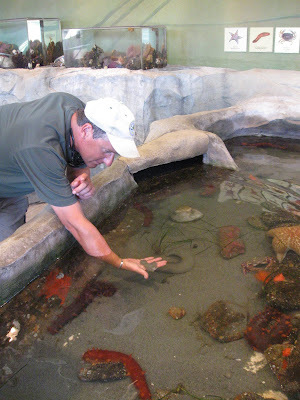 I set off to North Beach in search of some new treasures for our Marine Exhibit. Collecting is one of my favorite tasks--I set out with a list in mind, but also get to discover new and interesting plants and animals that I didn't even know we needed. My list today was short: new plants for the tanks, breadcrumb sponge and some upright coralline algae to feed some of the nudibranchs and the umbrella crab. You may know that all three of these things grow attached to rocks, usually rocks that are big enough and heavy enough not to be pushed around by the waves. Luck was with me today-- I found several perfect specimens that were attached to small rocks which were wedged under some big rocks. I put them into my buckets and trudged back up the beach to my car. Breadcrumb sponge was everywhere! I was excited to find this Heath's Dorid, or Sea Lemon, grazing among sponge of exactly the same color. After I got back to the marine exhibit, I carefully placed each of my hard earned finds into different tanks. I was worried that I had only found one rock with the upright corraline algae on it. What would my umbrella crab eat? 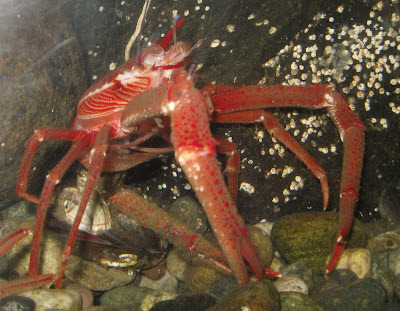 Then I spied him at the front of his tank devouring barnacles, which grow prolifically on small, easy to find rocks. Ha! Well one of the other great things about my job is that I learn something new every day.